Seriously, I don’t need all of this. Question is, what stays and what goes? I have a thing about bags. This may be because I’m female and do enjoy the odd handbag purchase now and again *cough* but I think it’s more about latent OCD calling me to task. There is much to be said for organisation in game, especially with the huge amount of raw materials you can currently accumulate when playing. If you look at my bankalt’s bank above (which I’m using as an extreme example) there is actually method in my madness: Fish, volatiles, gems and leather all live in their own specific bags… but I’m getting ahead of myself here. What do I need to keep, and what can I get rid of? Do I really need to keep it in my bags? Do I really need to keep it in my bank? Could it be sold on the AH to make me some money instead? 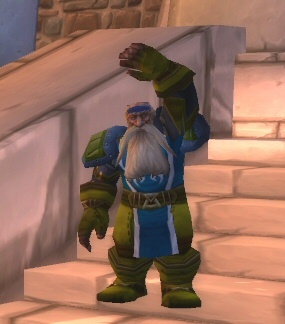 Could you use it for Mogging? If not, could someone else? Can it be handed in for reputation? If I do absolutely need to keep it, could it go into Void Storage instead? The first two questions are of course the key: the object of this exercise is to make some space. If at all possible we’d like to make you some money to boot, which is why you should be looking at the subsequent questions with care. The key to this is simple: if the item is of white quality and above, and it’s not soulbound, there’s a chance that someone might want to buy it. Take your character, go stand next to the AH, and check to see if anyone else is selling the items you have. If it’s armour of a certain type (Lord’s Girdle of the Bear) just type ‘Lord’s’ into the search window. 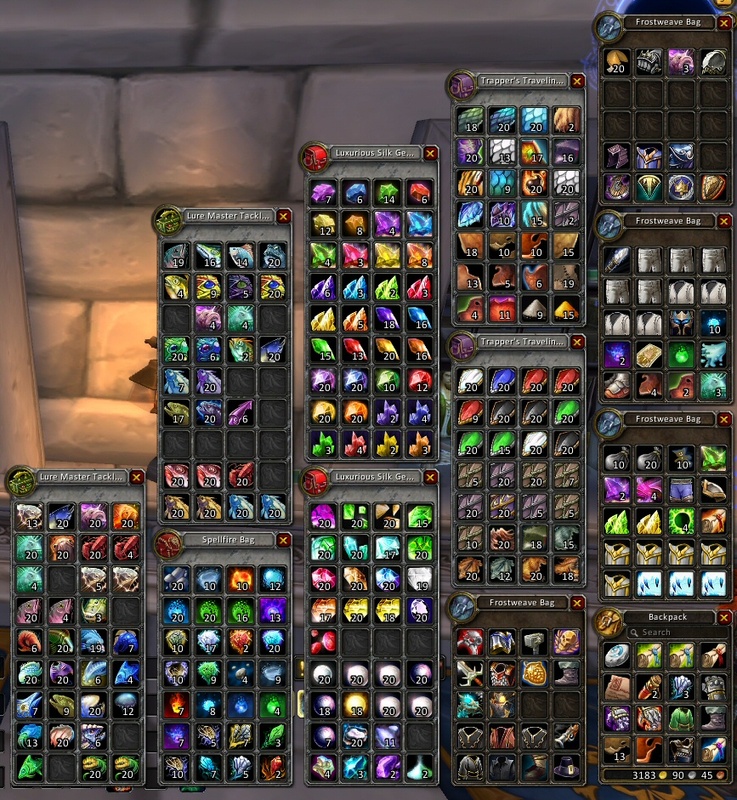 I’m not here to make you a fortune via Mog items, I’m here to make you spend an hour seeing if you can make more money with an AH listing than simply going to a vendor… so make time to do this. You may be amazed at what you end up selling. When you are sure your items aren’t needed, and you can’t make money with them ANY OTHER WAY, then go find a vendor. The question concerning reputation is also a valid one, and we’ll look at that in more detail tomorrow. Needless to say, if you do have a bunch of reputation items in your bags and you’re not maxxed with the faction in question, GO HAND THEM IN. Once you’ve done this with your bags, go do the same with your bank. 2. Consider Expansion, Check your Options! All the bolded bags are FREE: however, they are also unique (so you can only carry one) Most (with the exception of the Hexcloth Sack which is a quest reward from Heroic ZG) are attached to raid bosses that can now either be soloed by some classes or which are easily 5 mannable with some willing mates. All these bosses also drop gold, mogging items and in many cases have a chance of a mount, plus achievements attached. If you want a method that expands your bag space AND makes you some gold, this might be a route to try. Failing that, if you are prepared to farm the mats for bags, you could do a lot worse than ask in Trade for someone to make them for you. The AH, at least in this case, can be a last resort. 3. Long-Term Investment is Acceptable. Look at all that space. Spaaaaaaaaaace! I am still amazed at the number of people who haven’t embraced the concept of Void Storage. I think the problem is twofold: the 1000g you need to hand over to open it (with the 25g deposit fees) and the fact you can’t just shove anything in it. Suffice it to say with an Expansion coming you’re going to find lots of items (especially those linked to Seasonal Events) that you won’t want to get rid of but you could do with moving out of your bank: although Void Storage can’t accommodate them all, it can take a fair few. It’s also a great place to keep your mogging gear (as in most cases that has neither gemmage or enchanting to worry about losing) so you’re closer to the Mog Dude when you need to change a new item to fit your look. If you’ve managed to free up enough gold with your clear up to access the Storage and you haven’t already, I’d say it’s a wise long-term investment. 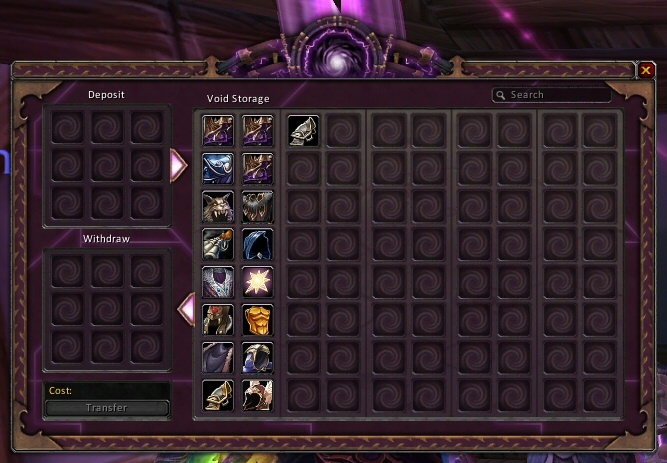 Considering (on my server) it costs 3000g for a 26 slot bag right now, this represents far more space (albeit with a set of caveats) and a long-term solution to your storage issues. However, if you want to store stacks of any item (including crafting mats) this isn’t an option, and you might want to consider adding a speciality bag to your bank with an extended number of slots just for crafted items. If you check my bankalt above you’ll see he’s rocking fishing, jewelcrafting, leatherworking AND enchanting bags (in which he stores volatiles/primals etc) Wowpedia has a full list of craft bags, and (again) if you can gather your own mats, you’re more than likely to find someone in trade who’ll be happy to make them for you. So, what are you waiting for. It’s Time to Spring Clean! For those reading this post, I wanna add 2 more nice things to the list; addons Reagent Restocker (automatically sells stuff for you!) and ArkInventory which organises your inventory very neatly after some configuration.